Straights SST series | Aluminium Ladder Truss up to 4m lengths. 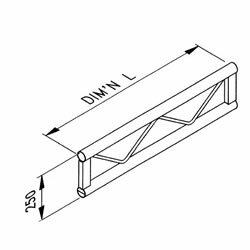 Special lengths are routinely available - priced as the next standard size up.In general, it is better to design your system from as few separate sections as possible - both from a cost point of view as well as for strength, and ease of construction. Powder-coating (variety of colours) and polished finish available on application.